Last week on the way home, this scripture came to mind ‘never the less, at thy word’. By the time I got home, that verse was just ringing in my heart. I walked in the house, spoke to my husband and grabbed my Bible. Found the scripture and proceed to read the entire chapter 5 of Luke. It was literally like quenching a thirst. If you have been a growing believer for as long as I have, you know the Spirit doesn’t just nudge you to read for fun or entertainment . I prayed and waited, prayed and waited but … nothing. Silence. Saturday came and went and still nothing on the verse. So I decided to let it go. If God wants me to see, hear, find, or help, he will let me know. All I have to do is meditate on Him and take him at His word. Then came glorious Sunday. I teach Sunday school to wonderful 5th graders. In the past weeks, we have been learning about David. When Uzzah reach out his hand to steady the ark of the covenant, he died immediately because God’s plan and instructions were not followed. A few had difficulty understanding why God was so particular. And once again, nevertheless at thy word, came to heart. 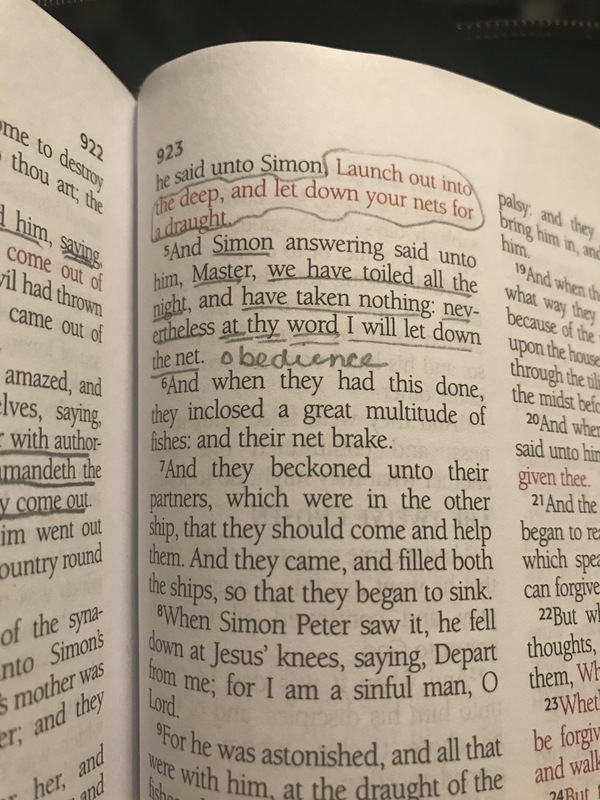 Although Simon did not fully understand, he chose to be obedient. After relaying Luke 5, I had them to think of times when a person of authority/ grown up asked you to do something they thought was unfair or that they did not agree with or understand? Oh yes! They all had stories to share on that one. But, the bottom line was obedience. Finally exhausting each scenario with obedience, one student proclaimed, ‘well I suppose God has it all covered! I thought, hmmm yes He really does. So this week I am waiting and praying for my need to be obedient as well as my growing students need to learn to be obedient.